Total Workshop search results: 48. Displaying Page 1 of your woodworking search phrase FULL SIZE COW. Feature a special hook that allows you to hang your bananas to reduce bruising and soft spots. Baskets hold apples, oranges and other fruit. Patterns drawn FULL SIZE. This cowboy is a fixin to start some trouble! Full size line art drawings. Custom sizing available. Color print also available. Our cowboy is ready to wrangle up his next wayward steer. Bull steer plan 05-WC-0991 sold separately. 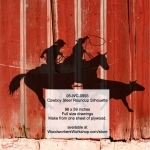 Our cowboy shadow yard art stands tall in the saddle and is easy to make using our full size templates. Custom sizing available upon request. This cowboy is ready for anything that comes his way! Full size line art drawings. Custom sizing available. Color print also available. Our cowboys are steer tripping out at the corral. Make this western style silhouette easily from plywood using a jigsaw, carbon tracing paper, black paint and our full-size pattern. Custom sizing available upon request. A easily recognizable longhorn steer shadow. Our full size drawing will allow you to make this shadow yard art from one piece of plywood. Custom sizing available. This simple life size silhouette of a cowboy shows him with his rope, an important tool either home on the ranch or out on the range. A full size pattern, simply trace, cut and paint! 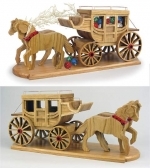 A perfect yard art project to mount to a fence or securely mounted on wooden stakes. Custom sizing available. For a mirror image, its easy, simply flip over your plywood project after its cut out. If you are feeling bullish, you might step into the ring with this big Texan! Our full size drawing will allow you to make this shadow yard art from one piece of plywood. Custom sizing available. When things start to get rowdy, Duck Holliday will quackly take care of it! Full size line art drawings. Custom sizing available. Color print also available. Moscow Watchdog is a breed of dog that was bred in the Soviet Union. It descends from crosses between the St. Bernard, Caucasian Shepherd, and Russian Spotted Hound breeds. Full size drawings. Bonus half size drawings included. Custom sizing available. A classic scene of a cowboy bare back riding a bull. Our full size drawing will allow you to make this shadow yard art from one piece of plywood. Custom sizing available. This cowboy eases back on the hitching rail to watch the people go by. Full size line art drawings. Custom sizing available. Color print also available. Saddle up! This cowgirl cutie sure knows how to wrangle in the herd! We provide the full size line art drawings and you decide what colors to paint. Make her a brunette or redhead if you want! Maybe you want her looking the other way? Let us know, we can customize your print for you. Custom resizing also available. Pretty much all you need is a jigsaw to cut it out of plywood. A classic scene of cowboys leaning against a fence rail. Our full size drawing will allow you to make this shadow yard art from one piece of plywood. Custom sizing available. Ride em cowboy! A bronc busting size of a silhouette. Our full size drawing will allow you to make this shadow yard art from one piece of plywood, all in one cut. Custom sizing available. Standing 72 inches tall, this cowboy stands and looks over the landscape! Saddle up for another of our full size western silhouette patterns! This project would look great in the yard, on the porch, in a store window or anywhere you like! Experiment with the black silhouette to create your own characters! Custom sizing available upon request. Our cow silhouette can be shown in either direction. 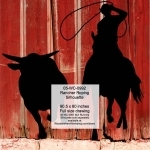 Stake it to show off in a field or mount it on a fence rail or the side of a barn or shed. Sized to be made from one sheet of plywood. Full size drawings. Custom sizing available. Y’all head on out, ya hear?! Now git across lots!! And who would hang around with a gun slinger such as this cowboy guarded its property. Our Skeleton Cowboy yard art project comes with full size drawings, easy to make and paint using your own favorite color palette. Rated for beginner woodworkers and crafts people. This project would look great in the yard, on the porch, in a store window or anywhere you like! Choose to paint as little or as much detail as you want. Or experiment with the black silhouette to create your own characters! Custom sizing available upon request. 96 inches long! That is one Texas size longhorn! Our full size drawing will allow you to make this shadow yard art from one piece of plywood. Custom sizing available. Standing 70 inches tall, this cowboy is ready to draw your attention! Saddle up for another of our full size western silhouette patterns! This project would look great in the yard, on the porch, in a store window or anywhere you like! Experiment with the black silhouette to create your own characters! Custom sizing available upon request.